孙宁, 张佳林, 张城硕, 周翔宇, 陈保民. 人肝细胞癌细胞DNA甲基化谱的检测及分析[J]. 中国医科大学学报, 2017, 46(12): 1111-1116. SUN Ning, ZHANG Jialin, ZHANG Chengshuo, ZHOU Xiangyu, CHEN Baomin. 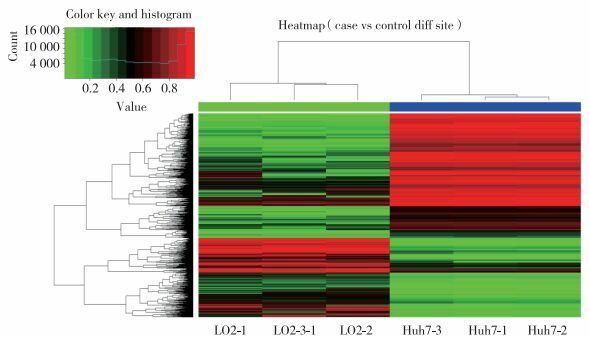 Exploring Genome-wide Profiles of DNA Methylation in Human Hepatocellular Carcinoma Cells via Bioinformatics Analysis[J]. Journal of China Medical University, 2017, 46(12): 1111-1116. Abstract: Objective To detect the genome-wide profiles of DNA methylation in human hepatocellular carcinoma (HCC) cells and to identify the distribution of differentially methylated sites and genes in order to explore the relationship between aberrant DNA methylation and hepatocellular carcinoma.Methods The Infinium Human Methylation 450K BeadChip was used to identify the genome-wide aberrant DNA methylation profiles in Huh7 and L02 cell lines.Results Totally 102 254 differentially methylated CpG sites and 26 511 genes, involving 43 signaling pathways, were detected when Huh7 and L02 cell lines were compared. The absolute β-difference in 57.3% of the hypermethylated CpG sites and 39.4% of the hypomethylated CpG sites was reported to be ≥ 50%. 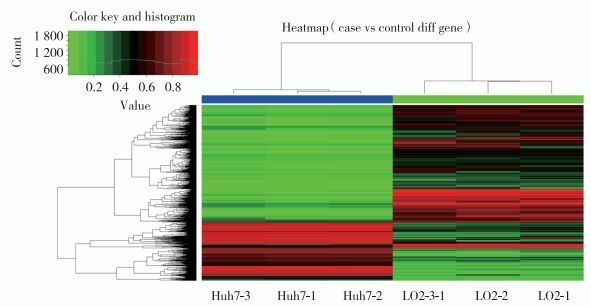 A total of 3 222 hypermethylated genes and 2 204 hypomethylated genes were identified.Conclusion We detected many aberrant methylated sites and genes in HCC cells. The abnormal DNA methylation exhibits an important role in the occurrence and development of HCC.